Last week I defined the US Federal Census. Today I want to share a brief overview of the Census in chart form. 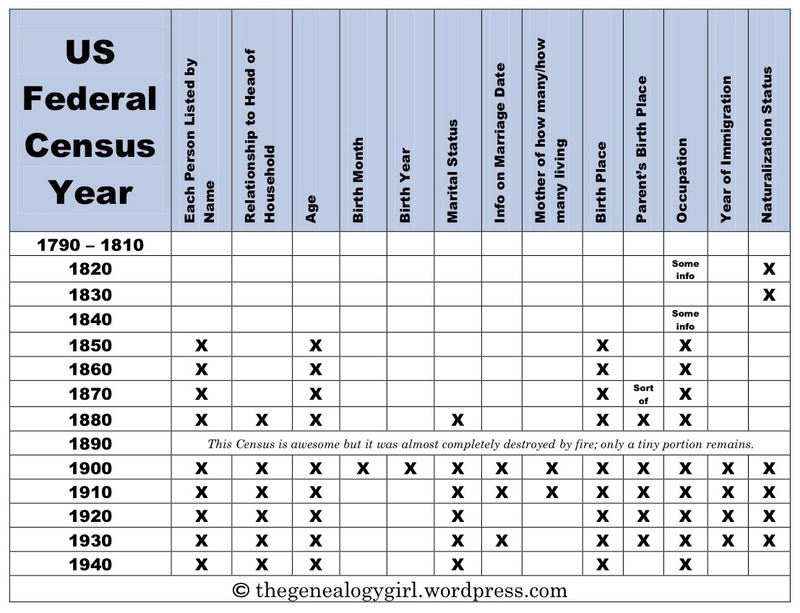 Not all Census years are created equal and this chart is a helpful reminder of the best features of the various Census years. It is important to note that the 1790-1840 Census returns only list the head of household by name with all other persons numbered by gender, age, free white persons, slave, and free colored persons categories. While these Census records give less information and are more difficult to use, particularly for beginners, they are still important and helpful. My next post will focus on the 1940 Census. I plan to work my way backward through the Census years highlighting the best features of each Census along with some tips to get the most out of that Census. Are you wondering why I’m going backward? Well, for the beginners out there they will certainly not find any use in the 1790 Census yet, but they can probably find parents, grandparents, or great grandparents in the 1940 Census. I will conclude my series with a few case studies to help illuminate how the census can grow your family tree, clear up mysteries, and make your ancestors come to life. The US Federal Census is an awesome resource! Really helpful table! Looking forward to the forthcoming posts!